If you love colour, then you've found the perfect collection. These fabrics are a celebration of colour and pattern, in a riot of shades. Beautiful, bold and fabulous these fabrics make a statement! 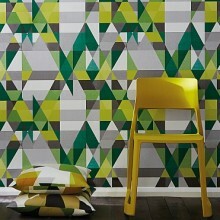 Designs include large scale florals, paint effect stripes and wonderful geometrics. The perfect match to the Spirit & Soul wallpaper collection, these designs are the perfect finishing touch to any room.